Learn to use the Top Tasks Management model for delivering an exceptional customer experience, because the best way to put your customer first is to make sure their top tasks are as easy to complete as possible. This workshop gives you the methods to focus on what your customers really want when they are online. These methods are particularly beneficial for large, complex websites and intranets, but also for mobile app development, and soon for implementing chatbots and robotic process automation (RPA). The first method, Top Tasks Identification helps you clearly identify the top tasks of your customers AND the tiny tasks. It is about developing clear evidence based on data within your organization about what is important—and what is not important—to your customers. You will be shown how to build a solidly reliable management model around these two essential metrics of the customer experience. 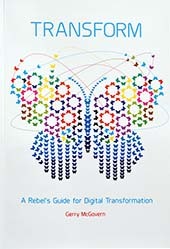 Participants also get a free copy of Gerry's latest book "Transform: The Rebel's Guide for Digital Transformation".